Yesterday was the sad last day of my kids’ spring break, so we drove our youngest back to his apartment and bought a Greyhound ticket for our oldest. Thinking we were being clever, we bought the ticket to originate from Eugene instead of Portland as it saved us $42. However, it turned out that the bus had broken down outside Eugene and the timeline was vague at best and featured the line “we’re hoping to get a mechanic up there within two to three hours.” We bit the bullet and offered to drive the extra three hours to get our oldest all the way back as there was the pressing issue of Monday morning classes. Unfortunately, I had convinced my sister and her son to accompany us on our short road trip with promises of fun thrifting/hanging out on campus. So yes, my sister got to luxuriate in an extra six (six!) hours of driving in addition to the four she signed on for. (My nephew hung out in Eugene with his cousin, and we swung by to pick him up around midnight.) And though the town of Ashland is nestled beneath a beautiful mountain and the main street is filled with adorable shops and delicious restaurants, it was too late to enjoy the amenities and definitely too dark to appreciate any scenery. I was able to get a refund on the bus ticket, as well as the $70 I spent on a bus ticket last week after my college senior decided to accept a late minute ride. Even though I’d been told that a refund wasn’t possible. We had approximately ten minutes in a Eugene thrift shop before I received the phone call about the broken down Greyhound bus. 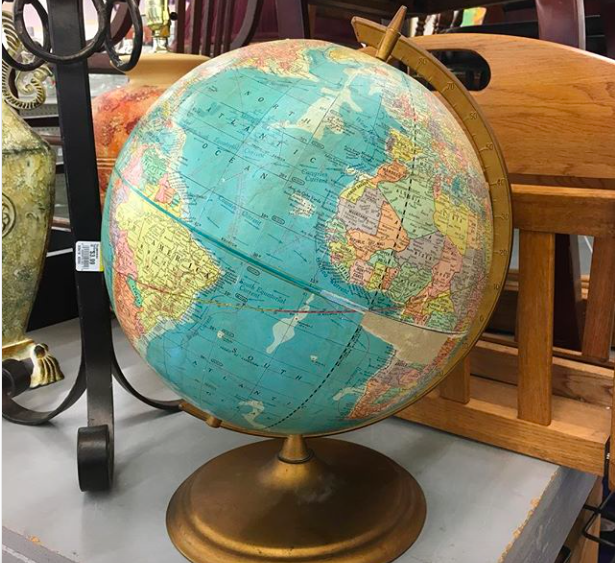 And in that ten minutes I scored a groovy vintage globe for the perfectly acceptable price of $4.99. We ate a late heavy lunch and didn’t have an appetite for dinner. We did run into the grocery store for snacks, but kept them simple with fruit, carrots, beef jerky and Chex mix. However, we all seem to have what’s now known as a “Chex mix hangover.” So! Much! Salt! We didn’t charter a Lear Jet, although I was sorely tempted. Those shelves right at the checkout at Goodwill are sneaky ones! Not just candy and snacks, but ours has brand new items for sale as well, which are more expensive than most thrift store buys. Plus, half the reason for shopping at thrift stores (for me at least) is to buy things second hand instead off adding to the environmental cost of buying new. I am trying my best to be less wasteful. It’s something I with been working harder on the last couple of years. I am using my blog to help me challenge myself. I put up a post today addressing an environmental issue and plan to keep posting things as they come up. I think talking about these issues may help, even if it’s on a small scale. 1. After last week’s financial “high” of paying off the last of my husband’s student loan, we are now talking seriously about how to pay down/off our mortgage faster. I used one of those calculators online to discover that paying an extra $500 a month would save us an astounding $50K of interest payments and shave ten years off the loan. I don’t think we can manage $500 a month this year, but perhaps we can start with $100 extra for now and graduate to $500 for next year. This possibility has really gotten my husband into the spirit of FI/frugality, which has always been “my thing” more than his, so that’s exciting too. 2. Last week was my daughter’s spring break, so my husband and I took a few days off so we could all go camping. $7 a night and the cost of a bit of dehydrated food (which we used our REI member credit to pay for), and we had an awesome outdoors vacation, took several great hikes, and enjoyed family time together. 3. On our way back from the camping trip we stopped by a national monument to hike for a bit and see the site. We needed to renew our NPS annual pass, which we use often enough each year to make it completely worth the $80. But the credit card machine was down and we didn’t have that much cash left. The ranger at the entry booth let us in for free so that we wouldn’t overpay. I’m happy to support the National Park Service, but this was a nice bonus savings and we’ll still renew our annual pass next time we are at an NPS site. 4. Since my husband and I are leaving next week for a conference we’re both attending, this week’s grocery shopping needed to be minimal to avoid food waste. I found in the fridge a few bits of veggies and in the pantry a can of tomatoes and a bag of dried black beans, so into the crockpot went a black bean soup that will serve us for dinner and at least one round of lunches this week. 5. My compost bin is full of beautiful black soil, so I’m going to use it to plant some strawberry plants–it’s amazing to see our food scraps turn into nutrient-rich soil that will continue to feed my family! I agree with you about the compost. When it works well it’s bountiful! We also use a worm farm, made from an old bar fridge, which produce castings and juice that our plants love. Yeah, the “when” part is truth! I live in a desert so my first attempt – an open pile – didn’t work at all; it just dried out. My husband built me a bin with a lid, which keeps the moisture in and gives me room to turn it over regularly, and that seems to have done the trick. I haven’t tried the vermicomposting yet, but my local master gardener swears by worms, so I might try it soon! Get your husband to pee on the compost heap occasionally: makes it compost better/faster! HA HA HA! I’ve never heard of that trick!! 18lbs of butter – how much toast are you eating???? Sorry- the 18lbs of butter question was for terri’s post! The nitrogen content of human pee is the key “ingredient”. Don’t know if men produce more nitrogen- or can just (ahem) “aim” better than women! DH and Dr. Bestest Neighbor have both always contended that one good pee outdoors is worth three indoors. Since they feel that way, I have traditionally encouraged them both to make full use of our compost heaps as, ahem, pissoirs. We live at the edge of town next to a woods. My husband and sons perform what we call after dark border patrol to discourage the deer. So I looked this up and you’re all right–apparently the nitrogen in human pee is helpful when mixed with compost! (I’d guess the “aim” part is why men—I’d uh, have some issues peeing into my compost bin!). I love learning new things!!! (And I read the butter comment and went “what?! I’m vegan!” So thanks for clarifying!). Lovely globe, and I loved the chair you scored in your previous post! 1. My kid bought me a bone-in ham for my birthday (I love ham, and he knows me well). I made ham with a fig sauce (free figs from my mom’s tree), potato salad, no bake cookies, coleslaw for Easter, and it was from things in my fridge or from gifts (ham)….score! I had leftovers for lunch today and will for the rest of the week. 2. I walked in the neighborhood on a lovely 80 degree day. 3. I listened to the radio for gospel music, blue grass, blues, and jazz ( I like all kinds of music). 4. I used my free stove (given to me by me ex…yeah everybody knows my frugal habits well….lol). 5. I reread the Grapes of Wrath (the book was free) and I am grateful that I did not have to endure what those folks had to go through. Happy Birthday, Cindy! I have East of Eden up next on my reading list. I love Steinbeck. Thanks so much Bee! I am so happy you are feeling better! East of Eden….one of my favorite books! Enjoy!! I actually loved “Travels with Charley”. Much different flavor than “Grapes”. I’m late to the party. Been having technical issues. Happy birthday!! 1) Got a free lunch combo (4 deep dish slices of pizza + soda) for free at Little Caesars today because of the March Madness upset where a seed 16 team beat a seed 1 team. Or something like that. I don’t care! Free pizza! 3) Took advantage of an American Express offer and got a $20 statement credit for spending at least $75 through Boxed.com. Only got things I needed that were reasonably priced, and spent exactly $75.52. 4) About to do 2 mystery shops that I signed up for. They don’t pay a lot, but they are very close to my house. 5) Tomorrow I sign up for my fall class. I had a choice between in-seat or online and decided to go with online. I don’t really like online as much but the school is 45 minutes away from work/home so this will save me gas and time! 1. Had a very low key Easter–I had the three kids who wanted to hunt eggs dye 12 eggs each, to be hidden and then traded in for a small snack-sized Baggie of candy. I was generous and also gave them a Cadbury Creme Egg if they found all 12, which is harder than you’d think–my husband is a genius at egg-hiding! We then keep the baskets of goodies on the fridge and they use a baggie for a dessert each night. We do not do huge Easter baskets with toys and whatnot–I have never understood those. 2. Made homemade lemon curd for my Easter cake, much tastier than the curd I could find at Kroger, which had lot of icky ingredients. Maybe not more frugal, but more satisfying since eggs were on sale anyway. I used a recipe from the I Hate To Cook Cookbook. 3. Easter dinner was tasty, a huge ham I got free with my Kroger checks, fresh green beans and twice baked potatoes. It was a winner because my youngest picky eater ate everything on his plate! 4. Found a slightly cheaper joint supplement at Trader Joe’s, to tide me over until my next shipment from Amazon gets here–I want to see if these have the same good effect and if they do, I won’t run out as easily. 5. This is a Frugal Panic: my husband is being invited to an awards banquet for his first professional award ever, and spouses and families are invited. Thing is, I have NOTHING to wear to any sort of event. I haven’t gone to an event of any kind in years. I wear the same thing every day (comfortable shorts or jeans, tank top, denim shirt) unless I’m going to the gym. I am having an anxiety attack because I don’t KNOW what my personal style is, I don’t KNOW what women in their forties wear to events, and I am hoping some ladies here could help me out. I’m not a fancy person, I don’t even wear makeup, but I want to look presentable and be comfortable and not embarrass my family! You are always safe with a black dress and pretty black shoes. You can always add pearls or other jewelry. Oops hit submit by accident…You may want to look for a knit dress or wrap dress. They are comfortable, do not wrinkle, and easy to care for. I agree with Bee – knit or jersey material is the way to go, and a wrap dress is super flattering. In fact, my daily uniform is knit/jersey dresses or skirts – whether I’m working or just running around town, I find them more comfy than pants and I always feel I’m dressed just fine no matter what situation I’m. So I’d say that something in this kind of material will be a multipurpose outfit for you, even if you don’t “dress up” often. And congrats to your husband on his award!! Solid color dress is the way to go. My fancy dress outfit for years was a red silk dress from a thrift shop, black flats, and my MIL’s string of pearls. Check out the Rimmel make-up at Walgreens. A powder, lipstick and a crayon eye liner will make you look polished without the stress of trying to master mascara. Forgot to add: Do you have a similarly sized friend you could borrow a dress from? Ruby–no, sadly, I am 5’8″ and my closest friend is about 5’4″. Bee, Cindy, Ruby–thank you! I love black and now will go looking for something. I’m thinking 3/4 length sleeves, that’s the sleeve length I’m most comfortable in. I have a small collection of pendants my grandfather gave me, so i will look for a nice chain to put one of those on. Thanks for the direction. You could try a silk ribbon if you don’t have a chain. That’s a great idea; I’m allergic to nickel so that would be better anyway. Thanks! Where do you live? I’m 5’8″ and have a black sleeveless V-neck Talbot’s dress that I haven’t worn in at least seven years. Sheath with a slightly flared skirt. No waistline seam. It’s yours for the postage. I’ll look back here for a reply. It sounds like you’d want to wear it with a sweater. How kind! I love this group..this generous offer makes my frugal heart smile. Unfortunately, I don’t have any good advice because I am in a similar boat. I am praying no one dies since I have nothing to wear to a funeral right now. Karen, do you have Clothes Mentor in your area? They have a shopping service that is free. You go on line and sign up. They ask what you are looking for. My example was: Work clothes, I added my size and added “looking to hide my tummy”. I arrived to 40 pieces waiting for me to try on! I had a great gal helping me and I realize not all will have someone of this caliber but just having the clothes pulled was a huge time saver. After all was said and done, they gave me 10% for using the service. I was stunned. I would have happily paid for this service but got a discount. I highly recommend them. 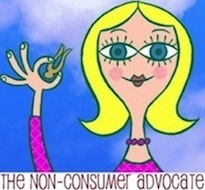 1.Since my family has cut me loose from frugal shopping for them I have a lot of time! No searching the adds for weekly bargins on things they love or use. Saving monies and time shopping. 2.Some things I will always keep on hand for everyone: Oatmeal, eggs, dried beans, dried rice, olive oil, cheap teas, dried noodles, spices, popcorn, cans of chicken and salmon, sweet potatoes, potatoes, frozen broccoli and other sale frozen vegetables. This stuff all has a long shelf life and anyone who wants to eat can help themself. I like making flautas, baked chicken thighs and roasted vegetables so I will still do that when I find great deals at my nearby stores. Oh and this morning I didn’t run out to load up on 1/2 price easter candy. !win! 3.I’ll also keep on hand dish and laundry detergent, shampoo and conditioner and bars of soap, and toilet paper. No longer searching sales of favorite brands, I’ll find the best prices at stores close to home. 4.I will no longer search for clothes and shoes family may need at thrift stores and garage sales. One thing I do enjoy doing is checking out the new 1/2 price cotton t’s and cotton shorts each week at Goodwill. My family can pretty much all fit in the same size of these so I keep a stack of these on a closet shelf. $1.25 for a perfectly great Banana Republic T shirt and $1.75 for a like new pair of Polo shorts is something I can’t pass up. I wear them and anyone else who wants to can help themself. 5.And now I’m looking for a small 2 bedroom house somewhere with low living expenses, taxes, and utilities and hopefully a low maintenance yard and walking and bicycling opportunities.One bedroom the master suite and one the dorm with bunk beds and small dressers to share. Everyone can bring what you can fit in your space. I am enjoying this new focus much more than trying to cater to everyone in a frugal way. I will be saving more and spending less time and money and throwing in a little adventure to boot. 1. Along with having lots of leftover ham from my pretty-cheap spiral sliced Easter ham, I’ve finally gotten excited about having a ham bone – for ham broth. After years of forcing myself to eat split pea or bean soup to use the bone (husband won’t touch either and I didn’t want to waste the bone), I was inspired by a post on another site to make ham broth last month. 2. Substituted a quart of ham broth for chicken broth to make Pioneer Woman’s Perfect Potato Soup. Oh my gosh it was GOOD. We both loved it. 3. Potato soup recipe called for Cajun spice mix, which I didn’t have because we tried it once and didn’t like it. Instead, I googled how to make Cajun spice and used all the ingredients in the recipe that I had in the cupboard. I figured the two ingredients I didn’t have were probably the ingredients that caused us to dislike Cajun seasoning in the first place. 4. Didn’t have the half-and-half or heavy cream the recipe called for but I did have sour cream. And since we both love sour cream on baked potatoes I figured I could substitute. Substitution number three, if anyone’s keeping track. 5. The result was very yummy potato soup which was the basis of two frugal meals, I have two more quarts of ham broth still in the freezer – and the ham bone that I tossed in the freezer from yesterday will give me another batch of broth. So nice to be loving ham bones after years of dreading them. 1.) Today I am making ham pot pies from leftover Easter ham and making ham broth from the ham bone and bits. 2.) This morning I reserved aquarium passes for free from our library’s website and I have been listening to a free digital audiobook from the library while working in the kitchen. 3.) On Saturday, I went to Fred Meyer and got, among other items, three free items with coupons (hot sauce, a protein bar, and a chocolate egg) and 18 pounds of butter on sale for $1.99 a pound (this is the lowest price I’ve been able to find on butter). 4.) On Friday, we paid an extra $1,000 toward our mortgage principle. By making extra payments toward our principle, we are hoping to have our mortgage paid in full in 3 years. 5.) I got a $5 check in the mail from a class action settlement that I learned about from the Class Action Rebates website. I’ve never heard of ham pot pies. I have an on-sale ham in my refrigerator and will try this with the leftovers. Thanks for the idea. Chicken and ham pies are frequently mentioned in the Harry Potter books, so those were a favorite when my kids were home. They’re pretty good! Seasoned with a little pepper and thyme, about 2:1 chicken to ham, with carrots and peas. Mmmmm. Teri, thanks for mentioning the Class Action Rebates website. I checked it out and it looks like I am eligible for one of the rebates. 1. I accepted some free things from a friend who’s leaving for several months, it included a bar of chocolate, about 10-15 kilos of rice, cheese, hamburger meat and a partial can of Pringles. 2. My body wash was getting empty so I put a little water in and shook it up. So far I’ve gotten 3 more showers out of it. 3. We didn’t spend much on Easter, but I did buy my kids a few candies that I his around the house. 4. We didn’t go anywhere or spend any big bucks this spring break, just stayed home as a family and last night let the kids “sleepover” in our room. 5. Reading my favorite frugal blogs. 1. I spent yesterday planting out my winter vegetable garden. I will have all our winter vegetables grown at home this year, unless cabbage moth attacks. 2. Some of what I planted was from seeds I saved last year, which is the most frugal way to garden. 3. We are still producing capsicum, eggplant, tomatoes and pumpkins in our garden. After gardening, I made a tandoori chicken, eggplant curry and a pumpkin and red lentil dal from our own pumpkin and eggplant. There is enough for dinner tonight as well. 4. We went to my parents’ for Easter lunch. Mum asked me to bring pumpkin for roasting. Easy! I love bees and I keep thinking about getting a hive for my yard. I need to keep my eyes peeled for a free lecture about bees in my area! I don’t think we can keep a hive of native bees. I have seen the blue-banded bee in my garden but mostly the non-native regular honey bee. I’d like to learn how to encourage more native bees. Apparently installing an insect hotel can encourage non-social bees. 1. Went to the library to renew my membership. Picked up for books I have been wanting to read. Also grabbed 2 DVDs. 2. Came home and immediately went online and ordered my museum/park passes from the library to use this summer. We love to go and it’s even better when its free. Future me will thank past me. 3. I have found $1.28 so far today. Everywhere I look today I seem to find change. 4. My sister brought me a container of lettuce and some cheese that she didn’t want to go bad. She was picking up my daughter/dropping off her dog and heading to NYC for the next 3 days. 5. I had pulled out chicken cutlets for dinner. I am going to grill them and make a big salad with stuff from my sister. Should have plenty for lunch tomorrow. 1. Ate leftovers for lunch even though I didn’t really want them. Was even tempted by a coworker ordering Panera for lunch. 2. Successfully submitted for a $150 pre-paid Visa for transferring a line to Verizon. 3. Dh fixed our gate using wood, bolts and screws we already had. 4. Meatless dinner tonight. And oatmeal for breakfast today. 5. Fed the rabbit scraps from our dinner veggies. Broccoli stem and pepper top for the win! Do you know what year your globe was made, Katy? I always think it’s interesting to see how the world has changed. I love the history. 1) Hubby, son and I attended sunrise service. Although it was foggy and the sunrise was not visible, it was still a beautiful morning. They had a violinist this year who played Amazing Grace, and there was a wonderful homily on the power of love. It was just lovely to experience such a positive morning in a world filled with negativity. 2) We had some time yesterday afternoon, We drove a few miles south to see a shipwreck that had been pushed ashore in the nor’easters that have pummeled the eastern seaboard recently. It is believed to be from the 1700s, and local historians are trying to identify the ship. Interesting and free! 3) I had to replace my car battery. I had a coupon and saved $10. 4) I sent inexpensive Easter cards to family members. These individuals are older and enjoy receiving snail mail. 5). I am wearing thrifted blouse, drinking water, running the ceiling fan to keep things cool, and eating leftovers — so many leftovers. Nice to see you still send cards too. My older family members are mostly gone but I send 2/$1.00 cards from Dollar Tree to some homebound members of our church. A couple of them cry when they see me and tell me how great it is to know that friends from church still think of them. So much happiness all for .50 and the cost of a stamp. Well worth it. I love this challenge. Your cards are beautiful, Kathleen. Christine, it is lovely that you send them to homebound members of your church. It is a small kindness that has a huge impact! I love the shipwreck sighting. It’s so eerie and wonderful when these ghosts emerge from the deep after centuries. Glad you got to see it rise! Bee, it seems as if you are feeling better. I am glad. I would love to see the shipwreck. I bet it was really interesting. Thank you everyone for all the good wishes. I am almost 100% again. The shipwreck was extraordinary. It will be interesting to see what the historians find. Sadly, they had to post a community service officer at the site until it could be moved. People were attempting to remove pieces with chain saws. Sigh…..
1. Got in 37 freelance hours last week over my regular 32.5, so yay for that. It will not last forever but I do need the extra $$. 2. On Saturday I was so tired that I considered using a maid service. I’ve never hired a maid before but I was sooo tired from working over the week before…it’s just me, I don’t have a spouse or helpers. Anyway, I cleaned my own house on Saturday so I saved $45 (or more… not sure how much a housecleaning service costs these days!) Everything got done and was clean and pretty by Saturday night. I was happy to have things nice on Easter. I splurged and bought myself tulips (which I shared with a friend) and a small orchid as a reward. 3. Made Easter dinner myself — a very simple meal — and it was good! I saved at least $70 by not taking us all out to eat. My mom is 92 so “eating in” is preferable anyway. Eating Easter leftovers this week, so I also saved time and energy by not cooking and $$ on additional groceries. 4. Bought 2 towels and Almay mascara using “Shop My Way” free points. $4 total. Sold a jacket for $38 on Ebay. I’ve been watching how Katy lists and sells on eBay. I’ve noticed that items listed long enough eventually sell! I’ve learned that OBO is a good way to go. People have been fair with offers and I want to get rid of the stuff, so it’s all good. I want to get better at reselling. 1. Enjoyed Coffee And…at church yesterday before the service. It was nice to visit with friends on Easter and enjoy delicious baked goods. 2. Received notification in the mail one of my side gigs is coming up…working the elections here in town. Nice to see the people I only get to work with sporadically and the voters, some from my old mail route. 3. My .99 Sunday newspaper was in my driveway yesterday morning, saving me $3.01 weekly. The coupons more than cover the cost. 4. A friend invited me to her house for tea tomorrow. Her spouse died in February and her mom last week so we can talk/cry together. It will save us the money from going to Dunkin Donuts and we can have privacy. 5. Brought more items to the consignment shop here in my town on Saturday. I love this idea as I get to declutter my house, make some extra cash and the organization that runs it which supports mentally challenged adults gets a share of the profits. I am still having trouble with posting. 1. Had a meeting on Saturday which prevented me from completing Easter tasks. Never got to Easter services which I love at this time of year. 3. Lots of Easter dinner leftovers which have been made into sandwiches and lots of meat for the freezer when (in the future) we will feel grateful for smoked ham! 4. Resisted going out for Easter brunch – much cheaper to cook from scratch and my kids have turned up their noses in past years at such delicacies as smoked salmon which were included in the expensive price. 5. Revised April’s budget to include a few splurges which are good for me in the long run – keeps me from impulse buying which is my weakness. I am still having trouble with posting, also. I wrote a whole FFT’s and it told me I was spam when I submitted. I lost that one. I re-typed it and remembered to copy and paste that time. I did have to reload, but at least I had copied first. I love posting FFT’s but sometimes I just can’t. This “reloading the page” business is driving me potty! So irritating and I’ve lost quite a few posts- haven’t had the energy to repost most of the time! Why were the changes made to the site? I have been asking and asking about the changes, and why can’t this be fixed. I think a post about the issues wouldn’t be that much trouble and a kind gesture by Katie. I don’t post at all any more because its too much trouble and highly irritating –like all the trouble it took me to post this! I am looking for a globe. Maybe I will run across one around here soon. My daughter is very interested in the relation of her location to places. 1. Still using my blog for accountability. 2. Going through the kids clothes. Luckily, their sizes haven’t changed much so I won’t be spending much this summer. 3. My husband is taking the kids to school in his non-status symbol, a chevy volt, so we are currently using no gas for that daily trip. 4. The hygienist gave my kids several extra toothbrushes. She said “the whole office hates this kind”. Lucky for me, we aren’t picky and were glad to take them. 5. I’m using my luna(diva) cup. So far, that cup has saved me $144 in feminine hygiene products. I have had it for 2 years. #3 – I think my husband would be very envious of your husband’s “non-status symbol” – he’s wanted a Volt for a number of years now. How do you like it? Actually, I love it. So much that I am considering getting one in the future. I have a good car that’s paid for so I’m going to be driving it for a long time. I have to put premium gas in mine and he rarely ever puts gas in his so, yes, we love it! I like that it is electric, but has a gas option, so we won’t be stranded from lack of gas. You would never know it’s electric from its performance. Lots of power and looks sporty. 1. Cut up two holey, threadbare hand towels for rags. 2. Used a plastic mailer that couldn’t be reused as a mailer as a small waste basket garbage bag. 3. Hung up three loads of laundry on the drying racks. 4. Stayed home. Had a 2.5 hour budget meeting withy DH. We are on our last debt in our debt snowball and will have it paid off in 9 months or sooner instead of two years from now. 5. Put a quarter in the change jar. On the rare occasions that I have to get a garment dry-cleaned, I use the clear plastic cover as a bin liner. Just take the hanger end, knot tie a knot in it, turn it inside out and you’ve got a large-capacity rubbish bag – although not massively robust, it’s fine for an indoor bin. Made soup from leftover Lamb roast bone, barley and some beef casserole seasoning I found hiding in the pantry (exp 2015). It’s yum! For 6 serves the cost was negligible. Brought some bananas at 50c/kg, usually $3/kg. Some were perfectly fine to have with our morning cereal but I’m loving banana bread at the moment so some will get used for that. Found a brand new chef’s jacket for my chef daughter at an op shop. Cost was $4.25. She usually pays about $40. I also found a few clothes items for me including a new hat, total cost $15. Our water provider (state government owed) has a deal for water saving garden products. We claimed the vouchers and so saved half the cost for about two years worth. I’m thankful we have been frugal for so long. It means that we have access to cash when we have unexpected expenses like the car and trailer repair. If this had happened when I was a sole parent living from pay to pay with two children I would have been a stressed out mess. 1. Made a “clean out the fridge” stew yesterday. Normally these are prety good. This one, well, we all took one for the team. It was whatever. 2. Had the family over for a cookout on Easter. As we hosted, others brought food. We were left with some hamburgers and hot dogs we are enjoying afterwards already! 3. Took grandkids for 3 days 2 nights during Spring Break. Did not go to Myrtle Beach and drop oodles of money. Cooked at home (with their help!) so no meals out and played at home. One trip to the beach (just the cost of parking) and an outing to a Games exhibit at the local museum. $30 for the five of us but we consider supporting our local museum part of our community participation. 4. Had lovely last minute SIL house guest for 2 nights. Got to visit and catch up. SD came for one meal (all at home) and enjoyed visiting, looking at old pictures. 5. HOURS of fun and enjoyment with our new kitten. he is a rascal! He Loves people which is such a pleasure for us. He is worth his weight in gold. 6. Bonus. The spring weather has us up and out walking, gardening, and biking. Feeling revitalized with gym membership. Embarking on The Glycemic Load Diet again. Basically drop almost all bread, potatoes and rice. Feeling really good! So grateful that losing weight is our only health issue. 2. Made my sons education account a bit bigger, although any extra $ is definitely going towards the beach house renovation. It is a crunch now to get it done for the season. But the permits are done so the real work begins. 3. Turned down an invite for a night in Atlantic City even though I SO wanted to. The last couple of times I went I came home ahead, so I expect to lose the next time. 4. ShopRite had a gift card promo last week- buy $50 worth of Home Depot cards and you get $10 to use this week in groceries. I had 3 cards to use, so I have $30 to spend this week on groceries. Decided to make it a game to see if I could only use those certificates and no extra money. I will have to poke around the freezer to make this work. 5. Did not watch the gold plated leader’s shenanigans this week Better for my sanity and productivity. 2. DH has a Dr. appt near some relatives. He wanted to meet them for lunch (which always translates to him treating them to lunch, never the other way around). Since I’m on break this week, I’m going with him, packing some yummy lunch food, and meeting everyone at one of my in law’s house! Everyone sees each other and we save $$. 3. Stretching the lunch choices by including egg salad as an option, cheap but good. 4. DH talked one relative into bringing the chips. 5. Will warehouse shop while we are “in town”, I’m going along to make sure we price check. Groceries are expensive where we live, but that doesn’t mean we should overspend at a warehouse either. Frugal fail: our septic system needed a new drain field. So I think I already told you that. Update is that they tore up our whole lawn. DH is pretty sad. Ack, sorry about the bus fiasco! I can’t imagine how frustrating that would be. Ugh. 2. I made an actionable plan to make more in freelance income this month, which can hopefully help with my medical bills from March. It’s expensive to stay healthy, y’all! 3. I made an Easter basket for our nephew using his old Easter basket from last year. I filled it with Rice Krispy treats shaped like eggs and covered in white chocolate. They weren’t fancy, but I think he liked them! 5. I bought matcha powder last night so I could make a tasty matcha latte right at home. 1) I got home last evening to find that my husband had the day off. Apparently, he’d just finished a bag of popcorn, so I wasn’t about to cook dinner. I popped a bag for myself, ate a banana and called it good. 2) I have leftovers from Sunday for lunch today – grilled pork, Asian mixed veggies and mashed potatoes – YUM! 3) I have a very pretty comfy long sleeve, black top I thrifted a few years back. I’m wearing that today with my 5 year old khakis and the brown leather mules I thrifted several months back. 4) I used a dozen of the farm fresh eggs my cousin gifted me with, a few weeks back, to dye as Easter eggs with my granddaughters on Sunday. They were already different colors brown, blue & light green – but they sure made pretty Easter eggs with the dye and painting the girls used on them. 5) I’ve been slowly eliminating small monthly payments and it’s adding up to help me eliminate debt. Once my car is paid off this Summer, I should be able to put the extra toward my student loan and be free of it soon, I hope. 2. My mother loves dish towels! She just can’t resist the urge to buy them when she sees a good deal. At a weekend trip to Costco’s she found a pack of 10 that she could not pass on, so she gave me 5 of them! Neither of us NEED dish towels, but mine are getting quite grubby, so a few new ones is nice. 3. After three Easter Egg hunts, we are now fully stocked with candy for some time. One of the egg hunts even had some free kids meals at Texas Roadhouse and free go cart rides at a local place hidden in the eggs. We will have plenty of summer fun ahead of us for Free! 4. My college aged nephew joined us for Easter. Though he wouldn’t take groceries home with him, he sure didn’t pass on a free tank of gas!! His family (my brother) was traveling during the holiday and he would have been alone, so I invited him to our house and promised him a free tank of gas. He did have to drive about 4 1/2 hours to get to my house from college. In the end, the poor kid was sick, so he slept much of the time he was here, but he obviously needed it and got some well deserved pampering from his Aunt and Grandma! 5. Still selling a few items at a time on Ebay! 1) Hubs met a friend at a new local pub last night to watch the basketball and catch up. Texted me an hour in to join them because he thought I’d like the place, but I think guy time is important, and besides Littlest and I were curled up on the couch watching some dumb show that’s all the rage with middle schoolers. Saved the cost of my drinks, plus he drank less so he could drive home – win/win! 2) Feeding a friend lunch at home today by repurposing Easter leftovers. 3) Running the numbers over and over again on next steps for the house. Definitely going to sell the one we live in and the rental (which has an offer), but rumblings in the larger economy have me thinking that jumping immediately into a purchase might be a bad idea. Patience might be frugal . . .
4) Elderly cat is having stomach issues, which seem always to be aimed at blankets whose tags say they require expensive special care. Turns out they do just fine in regular laundry, saving trips to a cleaners or replacing of blankets. 5) Texting messages of encouragement to my college-aged kids, who start a new quarter today. Neither of them got the classes they wanted. One was able to take other classes that will count towards her major, but the other decided to go part-time rather than pay for classes he doesn’t need. Wise, but discouraging, so hopefully a few extra messages from Mom will keep them on track. I am hearing the rumblings about the economy too.Our frugality will come in handy. Hope every one has a great week! Have also heard rumors about the economy, Just read a blogger whose political opinions I don’t like, but has generally been right about economic trends and he predicts a downturn. Lots of restaurant closings and empty storefronts in our area. As patricia notes, our frugality will come in handy. We are seeing weekly closures of restaurant chains over here in England too – hundreds of jobs going with each closure, cumulatively worrying for everyone, horrible for the individuals. 1. I get a free birthday meal from a local restaurant, which I used. The meal was fantastic and I had enough leftovers for lunch the next day. 2. We had a 90th birthday party for my Mother. Although the event was not inexpensive, my mother was thrilled. My siblings and I split the cost. We got a discount for paying with cash and we used dollar store containers filled with pansies from Wegmans as the center pieces. My siblings and I now have pansies to transplant and lots of leftovers from the restaurant. 3. I put together Easter baskets with baskets and stuffed animals I picked up for $75 percent off after Easter last year. 4. A friend embroidered my nieces names on the baskets for me. Now their mom has really nice baskets to use for years to come. 5. I also put together Easter egg hunt prizes using bubbles, stickers and Easter crafts that I purchased for half off. I was also able to use a coupon on top of the sale price. I used plastic eggs that a friend no longer was using. Hello my frugal friends. I have seen some of you post that you get a “Kroger check to use for groceries.” I shop weekly at Kroger. Can anyone give me directions about how I could go about doing this, as well? I do have their shopper card. Thank you! Love this site! You have to have the Kroger credit card to earn these, I think.